Only three days left, and I realize I’m not going to get to see it all. It gives me a good reason to come back. Madison Square Garden – notice concave ceiling – improves acoustics. I ask many people questions because I am either lost or confused. Most people don’t know too much outside their job. For example, yesterday in the museum I asked when I was on the fifth floor if there was the sixth floor of exhibits. The guard (what they appear to be) looked at me with deer in the headlight eyes, and whispered, “I don’t know.” I asked two clerks in Macy’s if the store had a beauty salon, and neither of them knew. In contrast, I can ask anyone anything about trains or transfers while I stand on the subway platform, and they know exactly. I’ve never had anyone say, “I don’t know.” I concur New Yorkers know how to get where they’re going and back again, but they don’t know much about where they are. 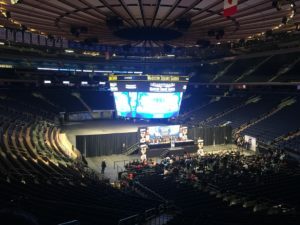 Tuesday, I went to the tour at Madison Square Garden, a first. 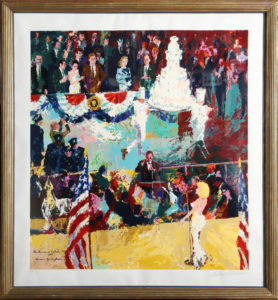 I’m not a big sports fan, but the photos in the building impressed me, especially the one by Leroy Neiman of Marilyn Monroe singing Happy Birthday Mr. President to JFK. They also played the audio of her song, with her iconic smokey—airy voice, during the tour. 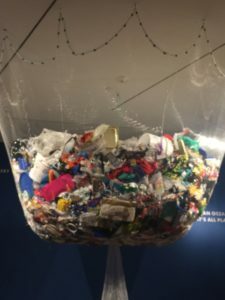 Museum of Art and Design: Exhibit showing how much plastic was used in four years by two ordinary people. A vision of conscious buying and disposal. I then went in search of NAWA, a first. (National Association of Women Artists, Inc.) I found the building, but it was not a museum or gallery. I asked the man sitting behind a small desk in front of the elevators if I was in the right place, and he said, “Yes, 5th floor, room….” I only heard 5th floor and didn’t pay attention to the room number, assuming it would be easy to find. Wrong. The floor looked like a hotel hallway; only doors with numbers. I asked a woman who was coming from one of the rooms, and she led me to a door and knocked. An artist, with paint on her clothes, answered the door and said, “Oh, that’s room 508.” She saw my look of despair, and said, “Come on, I’ll show you.” Nobody answered the door, and back to the doorman downstairs, he sent me to the 12th floor, saying they had two offices. On the 12th floor, the woman behind a desk said, “They are working on a juried show, and someone should have been there,” Luck was on my side as Mary Alice walked through the door and kindly took me down to see the gallery. She was a wealth of information. 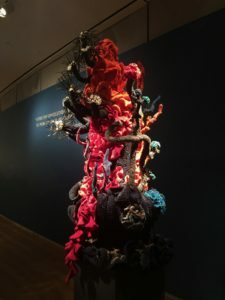 The exhibit, titled COLD, was a collection of paintings, mixed media, photographs, and fiber, all depicting how the artist conveyed COLD. I was surprised and a little sad that it took so much effort to see the accomplishments of women artists, and that it was a tiny one room studio. I then took the train to Brooklyn to see the Dumbo area, a first. It is under the Brooklyn Bridge. Many places were closed, but at least I saw it. I took the train and transfer (impressive, right?) 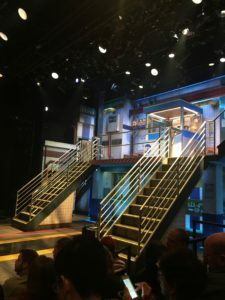 back to the Museum of Art and Design, a first, and then walked to the theater to see Transit, an a-cappella production of life in the subway, a first. Delightful. Only 3 days left but from what I read you have had an amazing time. I know a lot more about NYC now and that is definitely one on my bucket list! Thanks Jennifer. Thank you for your comments about NAWA. When I get the next catalogue for their major show, I will pay more attention to the location which clearly must not be the NAWA office or gallery. Sorry to hear it was such a pain to find! Look forward to your return. I think it was Linda Lee. It was the address in the New York Pass, and the only one mentioned. But, I thought it was sad, especially after being to so many grand museums. Of course, I need to remember it was a gallery, not a museum. I’m glad I was there just the same.